There Is no question that the world we live in is full of information about any topic you can imagine. This can be helpful and it can be a challenge at the same time. Especially when trying to find accurate information as it relates to your health. In this blog I’m am going to attempt to simplify a very complicated issue, Back Pain. There are only two types of Back injuries that lead to pain. For reference, we will be using the graphic below. The first category of injury is called Acute Trauma. This is an injury where you know the exact time and place where you were injured. You had an incident where you fell, or were hit, or slipped, or tripped, or any movement that suddenly caused the pain. In the diagram above this can be seen as the line that begins as a Red line and progresses to a green line. For reference, the x axis demonstrates that as you move to the right Time increases as well as money, pain and pathology. The Y axis demonstrates that as you move up the axis dysfunction increases which means that you have more difficulty with tasks that are normal to your life. 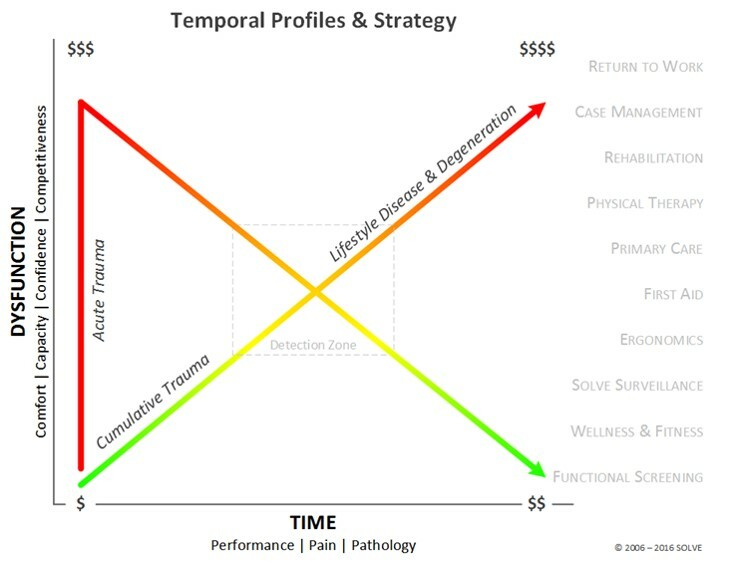 The acute trauma starts out way at the top of the y axis meaning the dysfunction is very severe. You may have fallen down and broke a hip. You know the exact time that the injury occurred and the damage was done quickly. As time goes on you begin to heal. The initial injury was very costly because you had to have surgery. As you move down the x axis you will begin to see that your body improves and your limitations or dysfunction goes down. The second category of an injury is called Cumulative Trauma. This is an injury where you noticed some discomfort on some days and some days you were fine. The intermittent discomfort may have been occurring over years. People typically describe this as “my back goes out once in a while”. This injury is demonstrated by the green line that begins to turn red as time goes by. This diagram also demonstrates a dotted line in the center of the graph which is called the Detection Zone. There is a time where there is dysfunction but to the untrained eye it may be undetected. As the person moves beyond the detection zone and to the upper right corner of the graph the dysfunction becomes great enough to seek help of experts. These experts might include primary care physician, physical therapy, surgeons, etc. So in all reality most people suffering with lower back pain fall into the Cumulative Trauma category. I would suggest that over 90% of people suffering with low back pain fall into this category. This means that the earlier it is detected and treated the less likely it is that the person will progress to severe limitations in ability to move. This also means that there is an opportunity to fix problems before they are detected or before they limit a person’s quality of life. So no matter the type of low back pain that you have been diagnosed with you need to recognize that the problem has been evolving or cumulating over time. This is because as you continue to ignore problems they cumulate. In order to stop this from happening you must seek the help of an expert who knows how to first detect the dysfunction and second treat the dysfunction. If you have interest in learn more about this topic we are hosting a Free Lower Back Pain and Sciatica Workshop and you can learn more by clicking the image below.